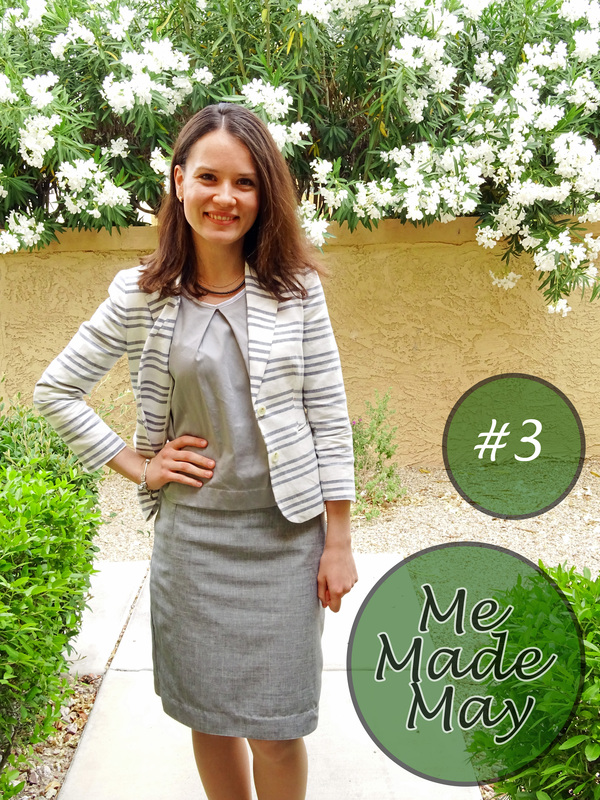 Me Made May #3 – Go ask Alisa – DIY capsule wardrobe one stitch at a time! 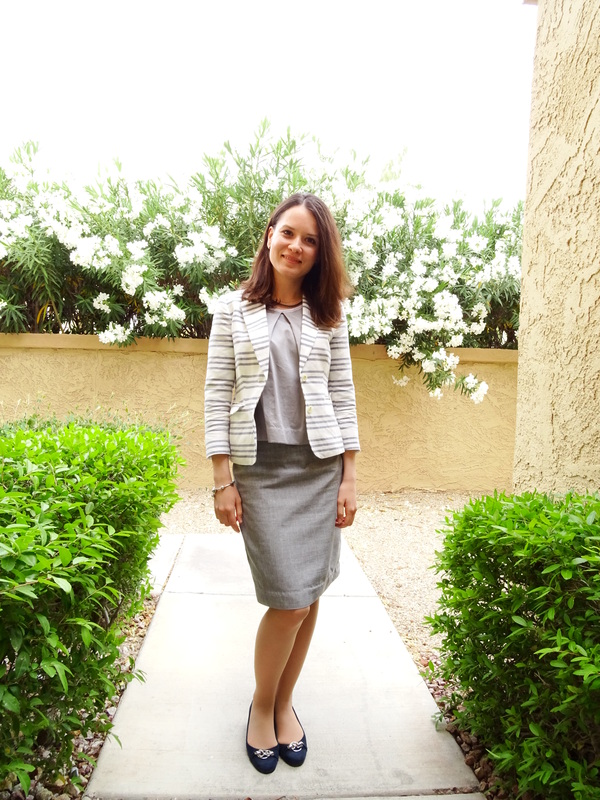 Me Made May continues with another outfit for my work days, this time in light grey and white. Although a lot of people may accuse grey color in lack of personality and brightness, I find it to be extremely refreshing when paired with light blue, cream and especially crisp white! This pencil skirt is one of my favorite things to wear for work, I made it out of non-wrinkle fabric which is super convenient when you just need to pull something real quick out of the dryer and run to work. 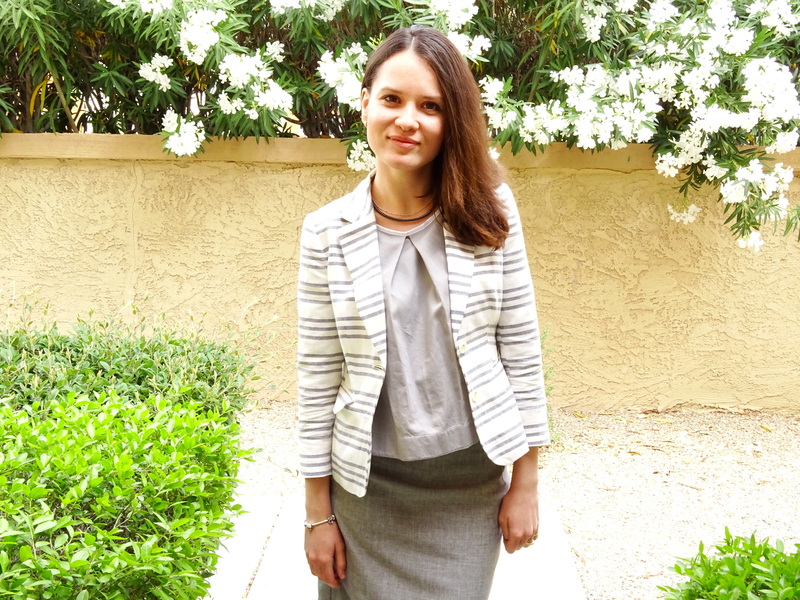 The blouse is the same from the previous outfit, and as you see it works great with both – black and grey combinations. To read the original post and view more photos of this skirt, click here. Pattern features only 4 darts, 2 seams and invisible zipper insertion. It was my choice to add black lining – that way I was 100% sure it won’t be see through. I omitted the waistband, instead I finished the waist edge with a narrow seam that worked out perfectly. Remember – finish your seams, press them open. I love this skirt pattern, despite every possible worry that I had about sewing a pencil skirt – it does fit me wonderfully and lucky enough – only one adjustment, skirt length. Other than that – it is a pretty good and basic pattern, after you make the first one and you’re happy with it – you can carry on with adding ruffles and buttons and all sorts of other fun stuff.